Rebel forces penetrated deep into the former southern stronghold of Yemeni President Abedrabbo Mansour Hadi on Thursday as Al-Qaeda freed hundreds of inmates in a jailbreak elsewhere in the chaos-hit country. The rebel push into the heart of Aden comes despite a week of Saudi-led air strikes aimed at preventing the fall of Hadi, who has taken refuge in Riyadh. 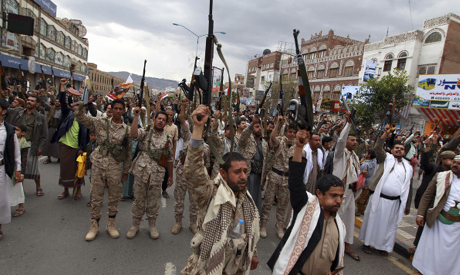 The Iran-backed Huthi rebels and allied army units loyal to former president Ali Abdullah Saleh were advancing on the presidential palace after seizing the key district of Khor Maksar, home to several foreign consulates and UN offices, residents said. At least 19 people were killed on Wednesday in clashes pitting the rebels against armed residents and local militia, officials said. Hadi fled to the southern city from the rebel-held capital in February. But he went into hiding last week as the rebels advanced on his last remaining bastion and later resurfaced in the Saudi capital. His aides have said he has no immediate plan to return to Aden. In the coastal city of Mukalla farther east, Al-Qaeda militants stormed a prison and freed more than 300 inmates including one of their leaders, a security official said. Khalid Batarfi, a senior Al-Qaeda figure who had been held for more than four years, was among prisoners who escaped from the jail in Hadramawt province, the official told AFP. Two prison guards and five inmates were killed in clashes, the official said. Batarfi is among Al-Qaeda in the Arabian Peninsula's (AQAP) top regional commanders, known for his leading role in a 2011-2012 battle with Yemeni government troops during which extremists seized large parts of the south and east. Al-Qaeda militants also clashed Thursday with troops guarding the local adminstration complex in Mukalla, a branch of the central bank and the police headquarters, the official said. Fighting also broke out at the harbour and around a presidential palace in the city, security officials said. The militants met no resistance as they seized the local radio headquarters, the officials said, adding that broadcasting was interrupted. Yemen has descended further into chaos since a Saudi-led coalition launched air strikes a week ago against positions held by Shiite rebels and their allies across the deeply tribal country. Observers have warned that Yemen-based AQAP, classified by the United States as the network's deadliest franchise, could exploit the unrest to strengthen its presence in the country. Before the latest chaos erupted, Yemen had been a key US ally in the fight against Al-Qaeda, allowing Washington to carry out a longstanding drone war on its territory. The coalition says its week-old air war is showing success, despite the rebel push into Aden. The operation "has excellently achieved planned goals at all levels -- air, ground, and sea," coalition spokesman Brigadier General Ahmed Assiri said. Rights groups have also expressed alarm at civilian casualties, including in an air strike on a camp for displaced people and the bombing of a dairy factory. Several dozen people were killed in both incidents. "All sides in Yemen's conflict need to do what they can to avoid harming civilians," said Joe Stork of New York-based Human Rights Watch. In the capital Sanaa, large crowds took to the streets on Wednesday chanting and waving guns in the air to protest against the air strikes. Diplomats in New York said that Gulf countries were locked in tough negotiations with Russia on a UN draft resolution to impose an arms embargo and sanctions on the Huthi Shiite rebels. In Saudi Arabia, Interior Minister Prince Mohammed bin Nayef met with southern border guard troops late on Wednesday and urged them to "strengthen security measures along the kingdom's land and coastal borders and to deal firmly with those seeking to exploit ongoing circumstances to undermine security," the official SPA news agency reported.